Most people may know Amphora as a type of large two-handled Grecian vase originally designed for storage. 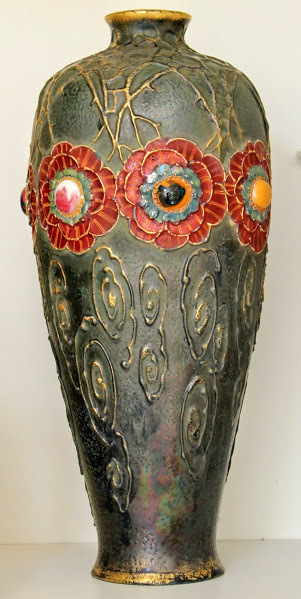 Art Nouveau lovers though, when visiting exhibitions regularly, know of a different kind of Amphora pottery. 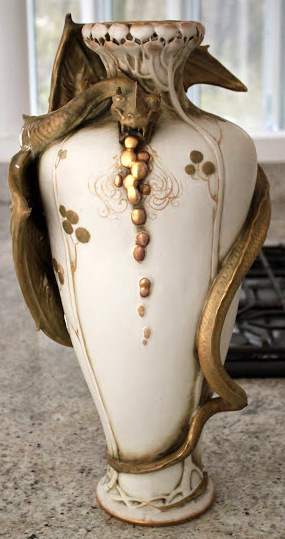 Personally, I love the pieces with the Mucha-esk ladies. 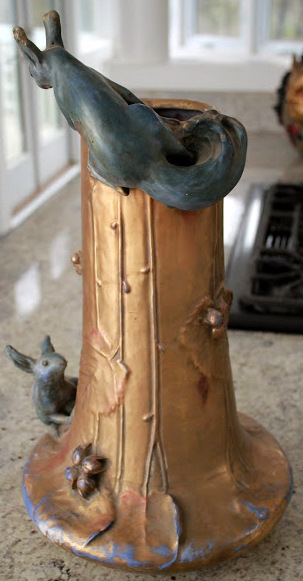 Vases with dragons and other animals, not counting some exceptions, are less my cup-of-tea. 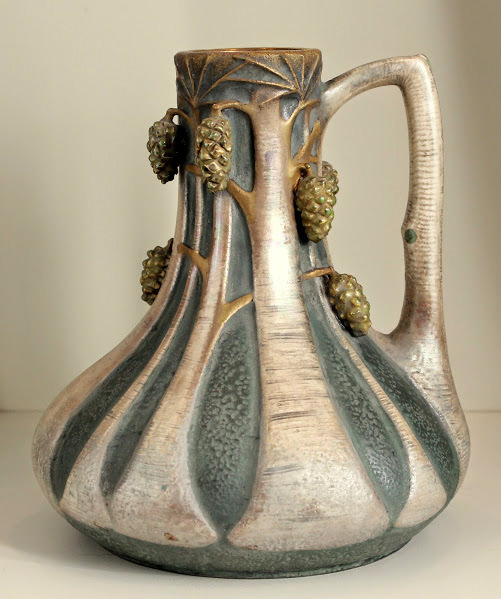 The name Amphora refers to art pottery produced by a particular company in Teplitz during the Art Nouveau era. There were up to 30 ceramics manufacturers in the kaolin-rich Turn-Teplitz region of Bohemia at the time. And they opened factories, closed again, changed owners, merged or shared common designers. 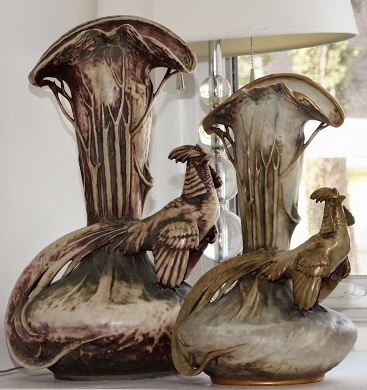 Antique dealers and collectors often refer to Art Nouveau pottery produced in the Turn-Teplitz region collectively as Teplitz. But the name Amphora is used exclusively by one particular company. 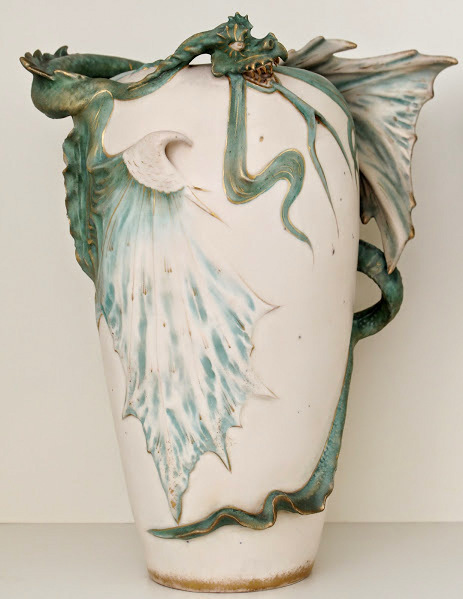 In 1892 Alfred Stellmacher, after having been a leader in ceramics production for 17 years, encouraged his son and sons-in-law to establish a porcelain manufactory. The first Amphora manufacturer was called Riessner, Stellmacher & Kessel or The Amphora Porcelain Works. 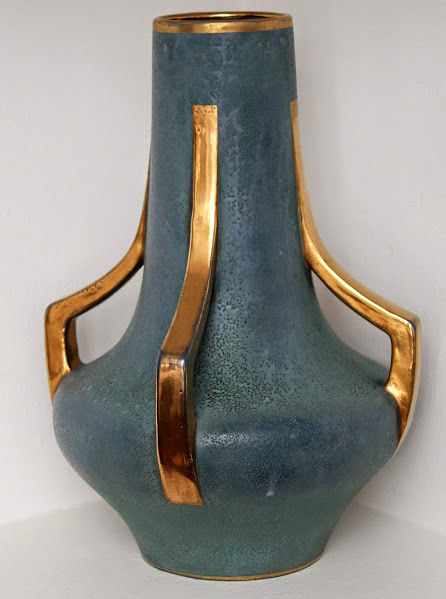 The firm consistently marked pieces with the word Amphora and became known by that name. They used a variety of marks with the word Amphora, a red ‘R.St.K’ mark, or the initials ‘RS&K’. 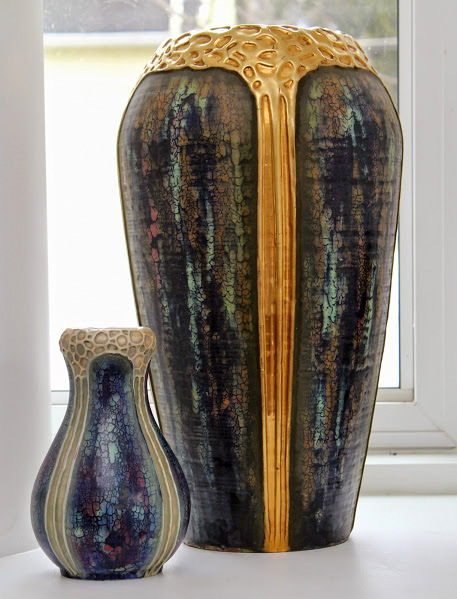 Combining unusual shapes with striking glazes, this company was recognized as the best in Amphora. The works were signed ‘Made in Austria’. 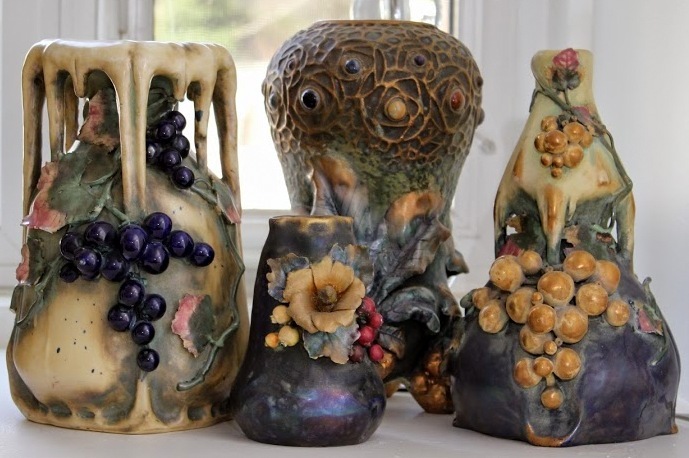 Thanks to skilled designers like Eduard Stellmacher, Paul Dachsel and a host of decorators from the Special Ceramics School of Teplitz, Amphora quickly developed a unique genre of Art Nouveau ceramics. When I learned about this school, I got very excited! Remember I wrote about Sergius Hruby a while back? Hruby used to be a teacher at that school! 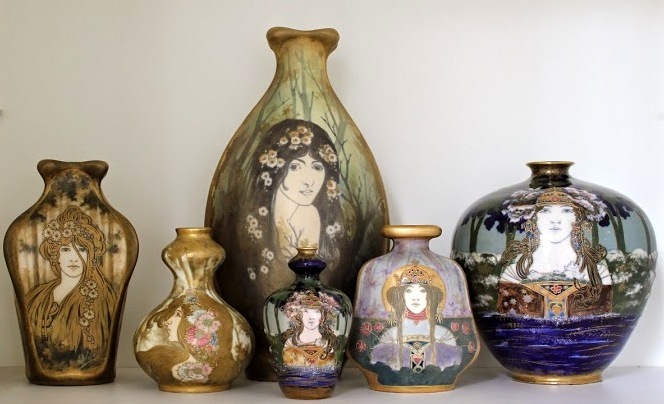 At the library of the Austrian Museum of Applied Arts I found several designs Hruby made for ceramic vases. An unparalleled concern for fine design and the use of Alfred Stellmacher’s ‘ivory porcelain’, a matte yellowish material that was malleable yet resistant to high temperatures, is what the products have in common. 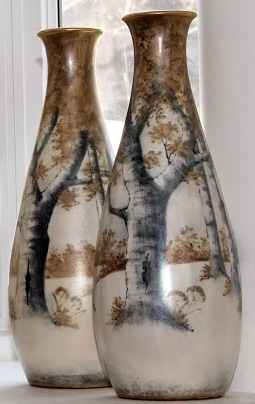 Amphora’s stylistic diversity, combined with its constant standard of quality, made it a world leader among industrial manufacturers of art pottery. The departure of Paul Dachsel in 1903 and Eduard Stellmacher in 1904 ended Amphora’s golden age. 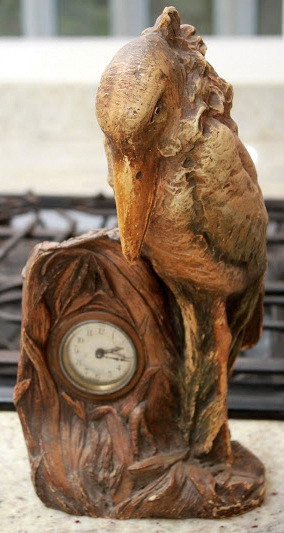 Hallo , are you still interested in buying Art Nouveau pieces ? Ik vind die draken juist wel spannend! Spannend wèl! Maar mooi? Mwah. Toch liever zo’n mooie Mucha-eske dame in Slavische folklore. Thank you for your kind words Art Pironti! And have a lovely summer in Barcelona!